What a heady and tumultuous eight months that whirled by with the first biracial president and African American first lady. My focus is the East Wing of the equation. 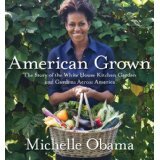 For the Obamas, two cute and curious kids, an internationally famous puppy and so many inspirational firsts or twists on the past such as the incredible Michelle Obama Kitchen Garden that are now part of the American presidential fabric. But not the electronic strand that marks a spot for the current generation or future ones. It also takes time to coalesce all the moving parts of a White House experience in the first year especially with appointed staff learning the history of the People's House, its contents and all who lived there since the muddy time of John & Abigail Adams. The White House is an eighteen acre bubble shared by an energetic family, military trained attack dogs, eagle eyed snipers, priceless antiques, a rambunctious puppy, incredible works of arts, thousands of daily visitors, vintage trees, a one hundred member staff dedicated to the Residence and now, the newest first lady's bees. That's just the stuff you see if on the premises. It is for those who are not on the premises that my post encompasses. After leaving the Vatican, the First Family heads to Air Force One to go to Ghana. The only way to understand the White House is to read voraciously or look at the pictures or if one must, suffer through the soundbites the traditional media thinks are important. What endures is the White House legacy. To that end if one is reading this post online, one should also be able to go to the White House website and find the riches and beauty of the house. It takes a while before new first ladies find their sea legs. Only two first ladies had a relative to call upon to get a multitude of details on the operations of a White House, Louisa Adams had her mother-in-law Abigail Adams as Laura Bush had Barbara Bush. Content on the White House website is important and even the West Wing is struggling to capture everything and get pieces filled in. The East Wing should join alongside the West in providing rich, detailed content about state or official events at the People's House. A great piece has been the live streaming of events on the White House website by both the president and the first lady. Time marches rapidly and before we know it, a year will float by before attention turns to making information available on the website. The Lincoln Sitting Room off the Lincoln Bedroom on the second floor of the Residence. Cataloging once again the art works for the public is critical. Certainly Laura Bush had some gaps, but one thing about her being n ex-librarian is that it was extremely thorough on her side of the White House web ledger. 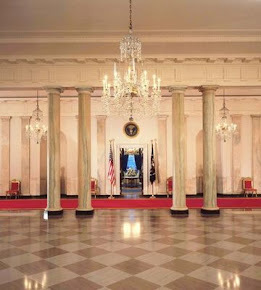 It was beyond outstanding and a model that future first ladies should follow with attention to detail to pieces of furniture, pre-scheduled Ask the Staff live chats, individual first ladies portraits and biographies, 3 D tours of renovated spaces - including the Cabinet Room and the Situation Room. Interesting and shocking that President Obama can be comfortably ensconced in the Oval Office decor of President Bush but not the technology savvy displayed on his website. A news sighting of the changing of the White House fountains to Celtic Green for Saint Patrick's Day was duly noted by the press, but its not captured as part of the new thinking the first lady is bringing to White House traditions. I'm waiting, but patiently not so much, as too much history is going by too fast. Michelle Obama oft repeats that she wants to bring the White House to people who have never seen it and offering up a robust web presence would do that for millions in this nation and millions if not billions more outside of it. Nothing has captured the imagination of global interest like her garden and the implications for nutritional value of home grown local food. Prince Charles waxed ecstatic about the Kitchen Garden and members of Congress along with other guests plus the family eat the fruits of the labor of the kids at Bancroft Elementary, Mrs. Obama, the White House chefs and the landscape crew. It would be great to talk about the garden in terms of healthy eating right at the site - rather than through the occasional news article prompted by a photo op. Every White House Pet is special. There was a Barney Cam - yeah, he bit a reporter for which first lady Laura Bush wrote a handwritten apology, Socks was a superstar cat and Bo is threatening to need his own reporter assigned to him because he garners so much attention. It was a wonderfully weird presidential picture as the Obamas went on vacation to see a baby car seat (for Maya's infant daughter) and Bo leave a helicopter in the same image. The East Wing smartly came up with a Bo piece that went into bags for the troops. It was pretty cute to watch Malia intently read the doggy bio information before she placed it in the backpack she was supposed to be filling at a service event. Malia is reading every detail. My goal is to see both the fun, academic and literary touches to the White House website. It's a tad frustrating at how long its taking. My sister and I really thank you for your support!